There’s little doubt among seasoned B2B content marketers that strategy is the key to success. In fact, according to the 2019 B2B Content Marketing Report produced by Content Marketing Institute (CMI) and MarketingProfs, the most successful content marketers (65%) are far more likely to have a documented strategy than their less successful peers (14%). What’s causing the disconnect? The report points to content marketing maturity: The more sophisticated your content marketing efforts become, the more success you’re likely to have. From our perspective, one of the key things that’s holding marketers back from evolving and growing their level of sophistication is likely in the data—both figuratively and literally. Every marketer has access to data, but many are often overwhelmed by it all and struggle to uncover meaningful insights to act on. Not too long ago, Forrester reported that companies only use 12% of the data they have at their disposal. Imagine what opportunities you could find hiding in that 82%. Furthermore, only 49% of marketers say they use data to enhance the customer experience. So, we say that in order for you to level up your content marketing strategy, you need to let data and your analysis of said data lead the way. Here are our suggestions on how you can walk the talk and turn your data-informed content dreams into a reality. Simply put, there can be no strategy if there’s no end goal. Your objectives are the foundation of your strategy, guiding your decisions and tactical mix so you can drive results. Your goals might be to increase organic traffic, audience engagement, or website conversions. However, to achieve success, these goals need to be measurable. And that’s where data and the insights you derive from it can help. To set goals that are reality-based and measurable, analyze your current performance for each of the goals you want to set (e.g. MQLs, organic traffic, etc.). Take a look at the month-over-month and year-over-year results in each area to determine your current monthly and annual growth rates to establish a benchmark. Then make sure your goals and benchmarks are included in your documented content marketing strategy. Ultimately, this will allow you to make more informed, specific goals that are easy to track and, hopefully, achieve. The success of your content marketing efforts hinges on your ability to empathize and connect with your target audiences. To do that, the content you create needs to resonate. It needs to help your audience solve their problems or get their questions answered. As a result, you absolutely want to use data insights to develop a more holistic picture of your target buyers—their interests, problems, behaviors, and preferences. Taking the time to do this can help you ensure your strategy is built on data, not gut feel or assumptions. Get started on defining your target audience(s) by reviewing your company’s website and social analytics with metrics like demographics, interests, age, industry, and behavior. In addition, leverage search analytics. Buyers have questions they’re searching for every day—and you have the opportunity to be the best answer. Lastly, ask your sales team for insight into the prospects and customers they talk to every day so you can more clearly define who your content needs to reach, what motivates them, where they’re active, what you hope to solve for them, and more. This qualitative data will complement the quantitative numbers you’ll find in Google Analytics (GA) and other data sources. The same CMI and MarketingProfs report revealed that 81% of B2B marketers believe the top benefit of a content strategy is that it makes it easier to determine which types of content to develop. Regardless of where buyers are in the funnel, a successful content strategy is able to provide a roadmap for content that will help move them through the funnel. And data can help you expertly map those pieces of content to the buyer journey. How should you get started? Take a look at your current content performance in GA and on your social networks. What’s resonating with your audience and what are they ignoring? Which pages and blog posts are converting? What is it about them that converts? Are they videos or blog posts? Diving deep into your current content results and how they help move people through each stage of the buyer journey will help you determine which types of content are the most successful at each stage. This process will also reveal the topics that are most important as well. Together, this provides a clear content journey to include in your strategy. In addition, data from your site’s in-site search engine can help reveal additional gaps and content opportunities. If your audience isn’t able to find what they’re looking for on your site, they’re going to try and search for it. And the in-site search report in GA reveals the topics they can’t find or questions they need answered. You know your goals. You know your audience. You know what to content topics and types resonates. But how are people going to find your message? You need to promote your content where your audience will see and engage with it. And data can help you determine where. Take advantage of the acquisition reports in GA to see where your audience discovers your content. For example, if social is a big traffic driver for your site, you should include a social amplification plan in your strategy. Plus, you can build out this plan even further by analyzing which social networks bring in the biggest audience. Armed with this information, you can form a content marketing strategy that not only has the right audience and the right message, but also the right channels. Your content strategy provides a roadmap for success, but as needs change, you may need to take a detour occasionally. As you execute your strategy, you may see shifts in audience behavior or content performance that require you to make adjustments to your approach. And that’s a good thing. You’re adapting and evolving your strategy to meet the needs of your audience. But without routine data analysis, those moves are almost impossible to make. So test your content ideas. Measure their performance. Optimize based on the initial results. And repeat. A/B testing tools like Google Optimize or Optimizely can help you make those important tests and monitor their results. Depending on what the data reveals went well and what failed, you can apply it to both your past and future content. 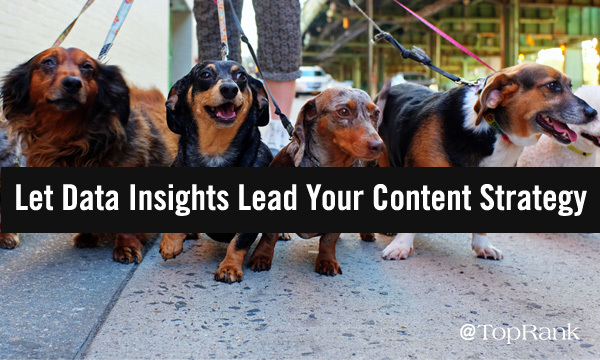 Where Will the Data Insights Lead Your Content Marketing Strategy? Regardless of your content marketing maturity, data insights hold incredible power for unlocking opportunity and building a more successful content strategy. Remember, the analysis piece has to happen in order to turn raw data into actionable insights. If you’re in the process of forming your content marketing strategy for 2019, let those insights lead your goals and benchmarks, target audiences, content mapping, and amplification plan. And keep reviewing your data on an ongoing basis to ensure your strategy evolves along with your audience’s needs. Want some more help building your content strategy and want more data to back it up? SEO insights can help. Discover six SEO data insights that can help you form your content strategy.